The number of affordable rental units up for grabs through the city and state’s housing lotteries has been on the upswing. There are now more than 30 open to a variety of household sizes and incomes, with the bulk of the lotteries geared towards low-income households. For instance, in buildings currently accepting applications, annual incomes for a single-person household range from $18,789 to $36,300 and two-family households from $20,160 to $41,460. However, a growing number of drawings are now available to middle-income households, where for those open, a single person can make anywhere from $44,400 to $105,875 annually to qualify. To stay on top of it all, 6sqft gathered all affordable housing buildings now accepting applicants and compiled them into one handy, interactive map. 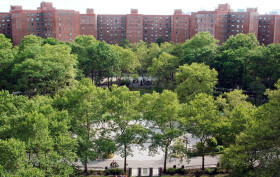 When news broke back in October that Blackstone Group had partnered with Canadian investment firm Ivanhoe Cambridge to buy Stuyvesant Town and Peter Cooper Village for $5.45 billion, one of the most talked about parts of the deal was that it would reserve 5,000 units of affordable housing for 20 years, 4,500 of which will be for middle-income families and 500 for low-income families. 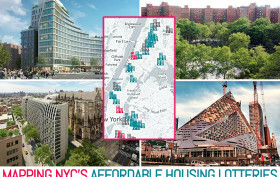 Starting today, qualifying New Yorkers can apply for one of these apartments, reports to DNAinfo. Through March 31st, the housing lottery will accept up to 15,000 names for the waitlist. 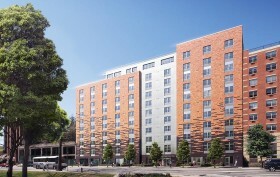 They’ll be entered into a randomized computer system that will assign a number to each applicant, and as more apartments open up, people will be contacted to move in. 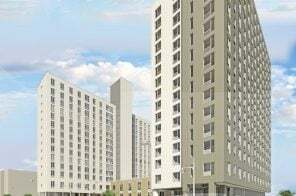 The units range from $1,210/month studios for persons earning between $36,300 and $48,400 annually to $4,560/month five-bedrooms for families of five to 10 making between $136,800 and $210,870. The Enclave at the Cathedral is a set of two brand-new rental buildings in Morningside Heights from the Brodsky Organization. 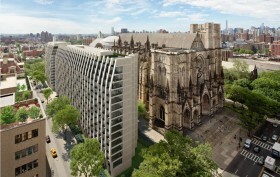 Offering a total of 428 residential units, the 13- and 15-story undulating towers were involved in quite a bit of controversy for their position obstructing the 123-year-old Cathedral of St. John the Divine, which just happens to be the world’s largest cathedral. But if this little issue doesn’t bother you, and you earn between $29,726 and and $51,780 annually, you can apply starting today for one of 87 affordable units, according to the NYC HDC. 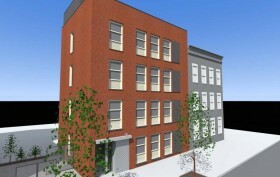 They include 27 studios priced at $827/month; 40 one-bedrooms at $931/month; and 20 two-bedrooms at $1,123/month. 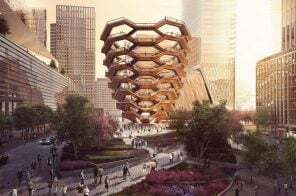 It’s been quite a week to up your chances of snagging an affordable apartment in the city, with housing lottery applications being accepted for 175 West 60th Street, PS 186, EŌS, and 149 Kent Avenue. 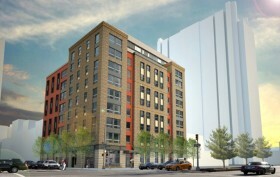 Now in booming Downtown Brooklyn, near BAM in the Brooklyn Cultural District, the Ashland at 250 Ashland Place has kicked off its lottery process, offering 282 below market-rate apartments, according to the NYC HDC. 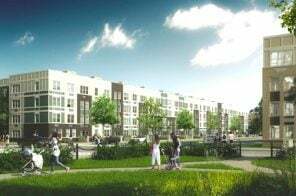 Unlike many of the recent launches, aimed towards low-income households, the Ashland is geared towards middle-income applicants earning between $28,835 for single individuals up to $200,400 for a family of six. 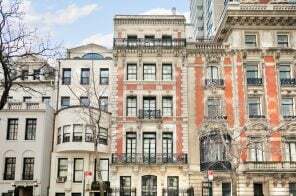 Those who fall within the income guidelines have the opportunity to pay rents ranging from $801 for studios to $3,649 for three-bedroom units. 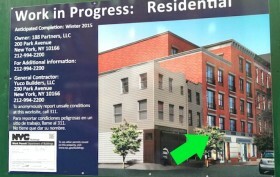 The latest in a rush of housing lottery kick offs is happening on Thursday at 260 West 153rd Street in Central Harlem, according to the NYC HDC. 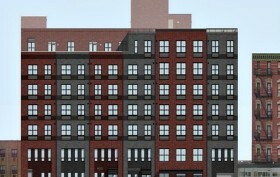 The brand new building is courtesy of affordable housing gurus L&M Development (who are also behind 149 Kent Avenue in Williamsburg, where a lottery is launching tomorrow). 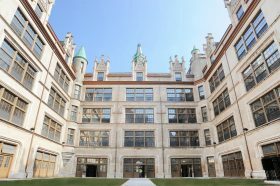 Of its 51 apartments, 34 are set aside for low-income residents earning between $23,349 and $43,150 annually. 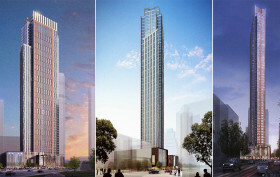 Rents will range from $641/month studios to $836/month two bedrooms.